Established in 1867, the Glasgow Art Club obtained their own property in 1892. Two mid 19th century town houses at 187 and 191 Bath Street. In 1893 these two adjacent town houses were transformed into the magnificent Clubhouse which still stands today. The design and works, including the breathtaking gallery, were by the architectural firm ‘John Honeyman & Keppie’ who employed Charles Rennie Mackintosh at the time. 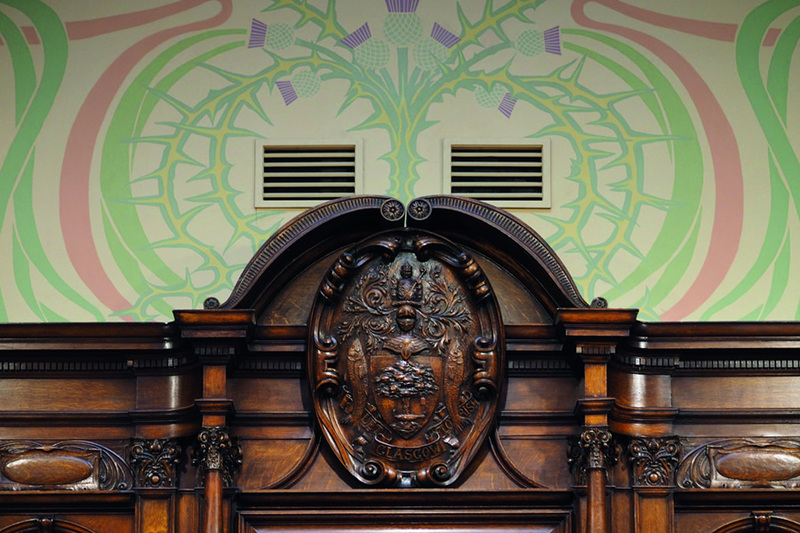 John Keppie was in charge of the scheme for which Mackintosh designed many decorative details. Amongst these was a frieze that has been hidden under several layers of paint for almost a century. It is not a well known fact that the Gallery is open to members of the public and you don’t need to be a member to come in and have a look around. Over the years the Club has evolved from a world solely occupied by the Arts into a diverse hang out for artists and non artists alike. See The Glasgow Art Club website for the latest news and event details.